We've all heard the saying "What goes around, comes around" meaning that if someone does wrong unto you, a similar wrongdoing will occur to them in the future. This is called karma; but is it actually real or is it just a belief that satisfies our thirst for revenge? 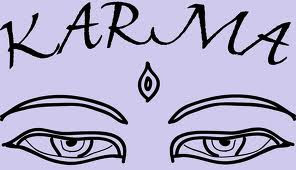 The term karma and its meaning comes from ancient Hindu and Buddhist philosophies and has carried over into the 21st century, making a great imprint on American society. Knowing that those who have hurt you will "get theirs" is comforting, and what is even more comforting is knowing that it is not your responsibility. Karma is the belief that the universe will recognize your hardship and make sure your enemy learns their lesson. Eric Butterworth, in his novel "The Universe is Calling" explained karma this way: “All mistakes, failures, and sins must be atoned for in some way at some time. They become a karmic debt that must ultimately, from lifetime to lifetime, be paid." Karma, however, is not tangible, so how are we sure it exists? We are not. People believe karma is real because it offers relief from heartbreak and betrayal. It places the burden of revenge upon a higher power, letting the damaged rest assured that the enemy will one day experience their pain. Karma, whether it is real or a myth, is often the only solace that can be found in betrayal.